For the first time that I can remember, Natty Guy and I are vacationing this week at a place we’ve been to before. Not just the destination, the actual hotel/resort! I thought I’d take advantage of the nice scenery to post a couple of OOTD pics. We enjoyed last year’s stay the the IHG El Presidente Cozumel so much that we are back for some more diving and fun this year. For more on things to do in Cozumel, check out this post! 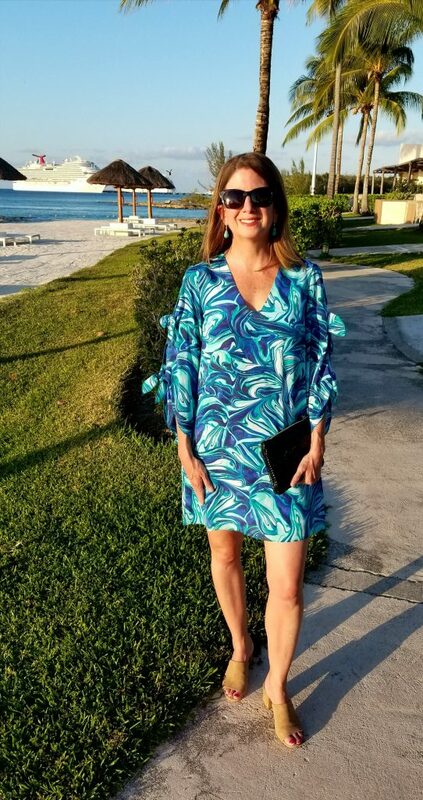 I picked up this Lilly Pulitzer dress (my first!) on a recent girl’s weekend in Florida. I’ve always loved Lilly prints but they somehow just feel like too much for me. This one, being a bit subdued by Lilly standards, was just what I was looking for! I’ve really been wanting a pair of palazzo pants and when this pair came up on the W by Worth portal of past season items I knew I wanted to try them. While recently I’ve seen quite a few wide over wide silhouettes, I still prefer to pair a fuller palazzo pant with a fitted top. The halter tank is a new purchase and I am in love! You can tie it several different ways for different looks – all equally chic and elegant! W by Worth trousers (prior season), similar shown here and here. Banana Republic Clutch (prior season), similar shown here. Thanks for checking in and hope to see you next week.! Have a great Saint Patty’s Weekend! Thanks so much Ada! Would love to join in your link-ups! Happy St. Patty’s to you as well and thanks for stopping by NattyGal.com! Elizabeth, I absolutely love both outfits! You are so chic and summery! I hope you had the most amazing vacation. This post will be a featured favorite on my link up post this Tuesday. Thanks so much for joining my party! What!? Thank you so much! I am beyond thrilled to be one of your featured favorites!! This week I will have to just dream about those outfits because we are due for yet another round of snow. Look forward to linking on Tuesday! That dress is beautiful! 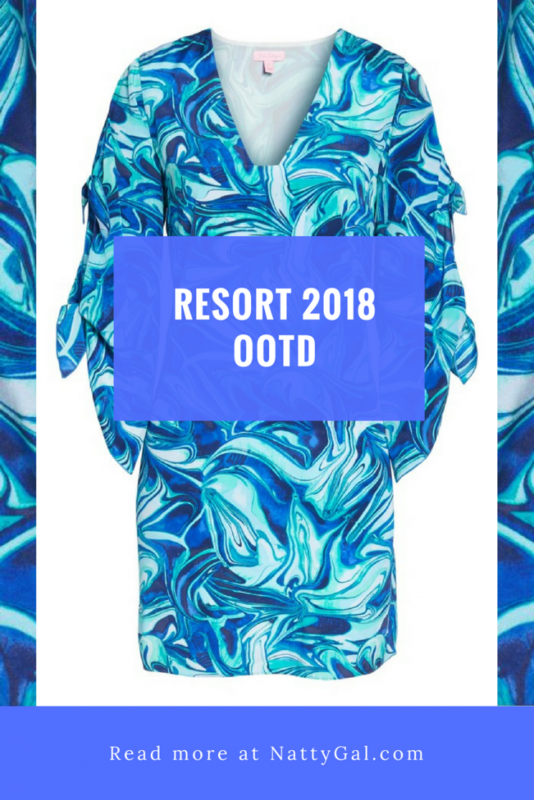 I love the print and the blue hues, it takes me back to evenings in Mexico, with a drink in hand and the wind gently blowing through my hair. 🙂 I also like the little sleeve tie-up detail. Great look. Thanks so much! Your nice description “drink in hand, the wind gently blowing…” will get me through any remaining NEOhio snowstorms! Appreciate your stopping by – happy weekend!